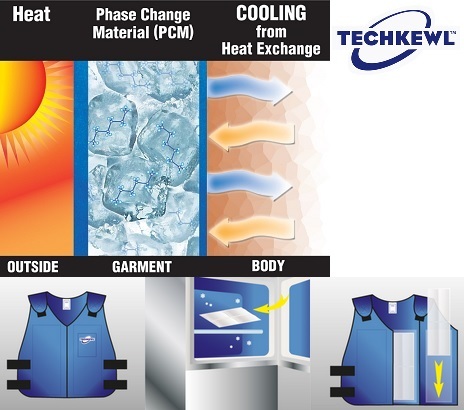 TechKewl Phase Change Cooling Vest with Nomex™ Fire-Resistant fabric. About Nomex™: Nomex\xAC is the brand name for an inherently flame-resistant aramid fiber that is manufactured only by DuPont. Protective apparel made with Nomex\xAC is a collection of inherently flame-resistant apparel manufactured by garment manufacturers that is used to help protect people from thermal hazards. Provide cooling comfort and heat stress protection in high temperature environments. 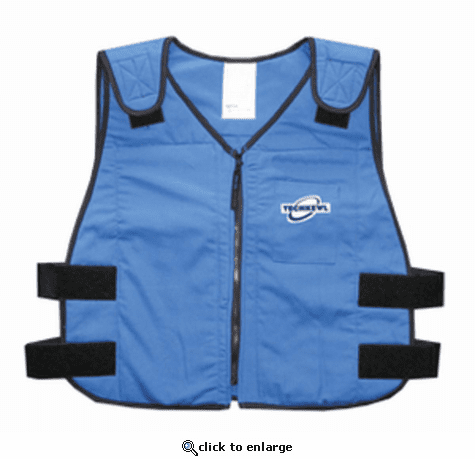 Commonly used in extreme heat under work gear, costumes, and other apparel. Phase Change Material releases long-lasting, temperature-specific (58 degrees F, 14 degrees C), cooling relief. Non-toxic, non-flammable, durable, reusable, lighter than water, and does not produce condensation. Simply place in a freezer until solid. Or submerge inserts in ice water for up to 45 minutes. Place inserts to garment pockets. QUESTION: Why should I wear protective apparel made with Nomex\xAC? Answer: Everyday work clothes, including cotton and polyester blends, are not flame-resistant and do not fully protect against the hazards of flash fires or electric arcs. Natural fibers, such as cotton and wool, and blends with synthetic fibers, such as nylon and polyester, all support combustion. Cotton can ignite and continue to burn, while nylon and polyester can ignite, burn, melt, and adhere to workers' skin. In addition, the explosive force of an electric arc can blast apart clothing made of cotton or polyester/cotton blends, exposing workers directly to the arc's devastating effects and any resulting fire. Although every fabric can be exposed to an arc with sufficient intensity to cause break-open, some resist better than others. Protective apparel made with Nomex\xAC helps provide high resistance to break-open. Protective apparel made with Nomex\xAC acts as a protective barrier and will not burn or melt and drip. This excellent arc flash protection helps give wearers more time to escape from a hazardous situation. QUESTION: What is the difference between inherently flame-resistant fabrics and chemically dependent flame-retardant fabrics? Answer: Protective apparel made with Nomex\xAC is inherently flame-resistant. The actual structure of the fiber itself is not flammable, which means the protection is permanent. The protection is built into the fiber itself and can never be worn away or washed out. When exposed to flame, the aramid fiber swells and becomes thicker, forming a protective barrier between the heat source and the skin. This protective barrier stays supple until it cools, helping to give the wearer vital extra seconds of protection to escape. Chemically dependent flame-retardant fabrics, such as Indura\xAC flame-retardant treated cotton, FireWear\xAC and FR rayon, provide a different type of protection. A chemical additive in the fiber or treatment on the fabric is used to provide some level of flame retardancy. During an industrial fire, chemically dependent fabrics rely on a chemical reaction to extinguish the flame. The heat of the fire and the amount of time the fabric is exposed to the fire triggers this reaction. As the time and heat exposure increase, heat transfer and the resulting burn injury to the wearer increase dramatically as the flame-retardant chemicals activate. These chemicals and the fabric produce vigorous afterflame, hot gases, smoke, and tars that can adversely affect the wearer. 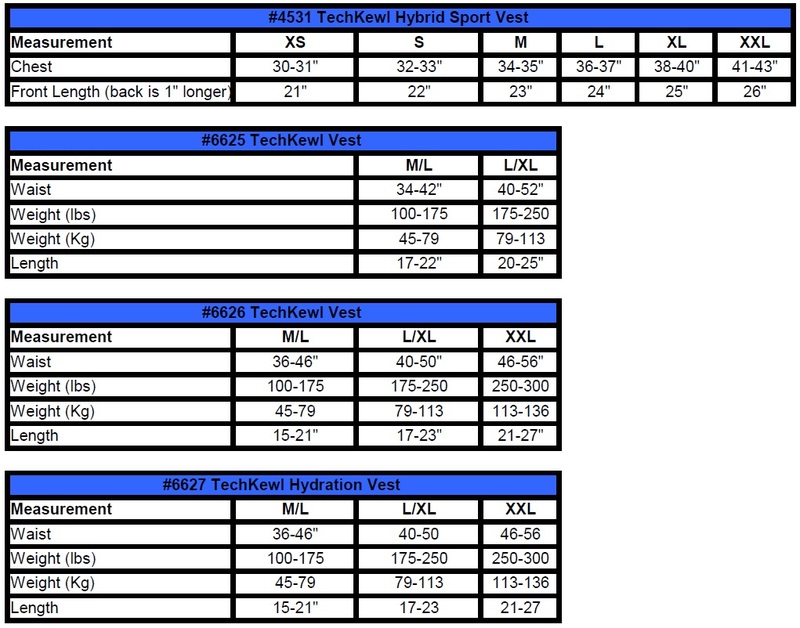 QUESTION: Is protective apparel made with Nomex\xAC chemically resistant? Answer: Aramid fibers have very good resistance to many chemicals, such as organics, acids, and bases. Although protective apparel made with Nomex\xAC fiber helps exhibit them with good chemical stability, most aramid garments are made of fabrics that are not designed to protect the wearer against chemical penetration.